Here is another good example why I have come to view parts of the climate science research enterprise with a considerable degree of distrust. 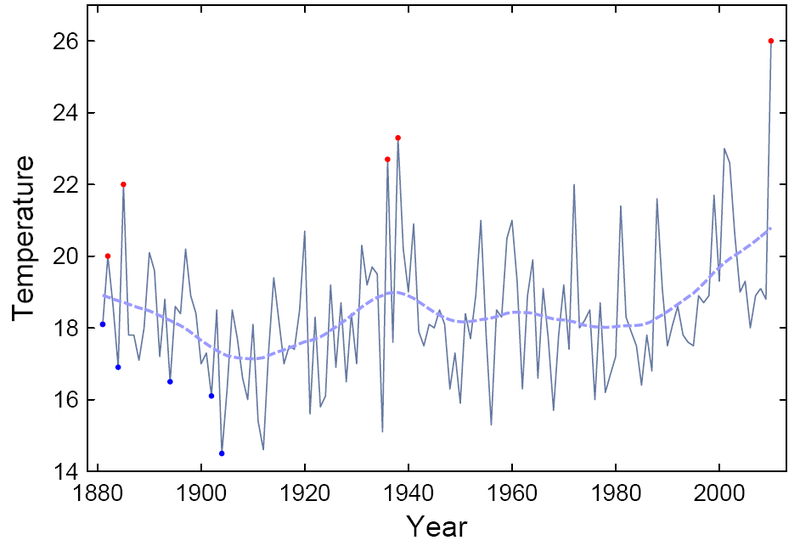 A paper was released yesterday by PNAS, by Stefan Rahmstorf and Dim Coumou, (also freely available here in PDF) which asserts that the 2010 Russian summer heat wave was, with 80% probability, the result of a background warming trend. But if you take a look at the actual paper you see that they made some arbitrary choices (which are at least unexplained from a scientific standpoint) that bias the results in a particular direction. Look at the annotated figure above, which originally comes from an EGU poster by Dole et al. (programme here in PDF). 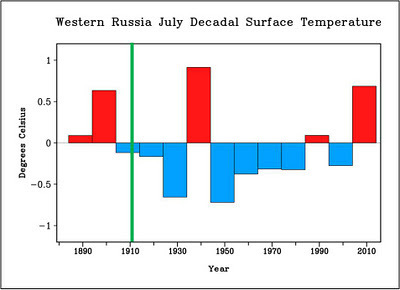 It shows surface temperature anomalies in Russia dating back to 1880. I added in the green line which shows the date from which Rahmsdorf and Coumou decided to begin their analysis -- 1911, immediately after an extended warm period and at the start of an extended cool period. Obviously, any examination of statistics will depend upon the data that is included and not included. Why did Rahmsdorf and Coumou start with 1911? A century, 100 years, is a nice round number, but it does not have any privileged scientific meaning. Why did they not report the sensitivity of their results to choice of start date? There may indeed be very good scientific reasons why starting the analysis in 1911 makes the most sense and for the paper to not report the sensitivity of results to the start date. But the authors did not share that information with their readers. Hence, the decision looks arbitrary and to have influenced the results. Climate science -- or at least some parts of it -- seems to have devolved into an effort to generate media coverage and talking points for blogs, at the expense of actually adding to our scientific knowledge of the climate system. 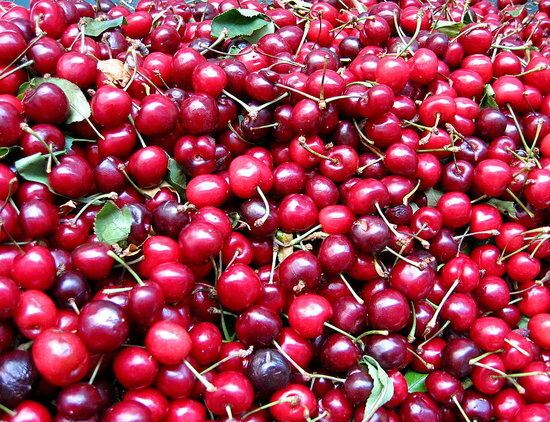 The new PNAS paper sure looks like a cherry pick to me. 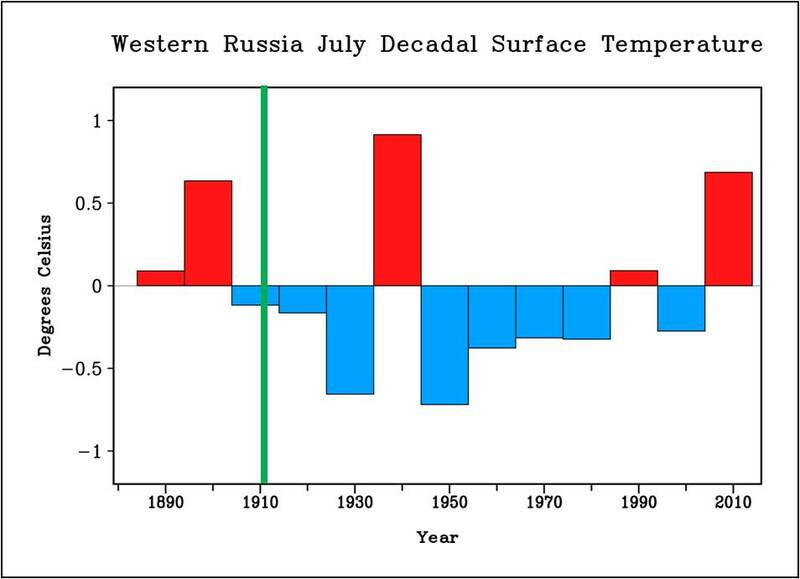 For a scientific exploration of the Russian heat wave that seems far more trustworthy to me, take a look at this paper. Are US Floods Increasing? The Answer is Still No. Does the US Lack Skilled Workers?